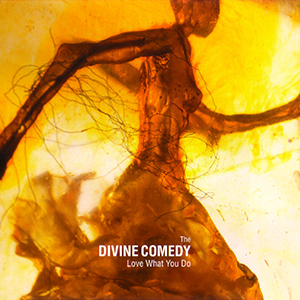 First single from Regeneration, and released ahead of the album in February 2001, Love What You Do was The Divine Comedy’ debut on major label Parlophone. It was also the first release since 1992 to not feature Neil Hannon on the artwork. The artwork only features works by Claire Burbridge, but despite any doubts, it’s indeed the same band which released Gin Soaked Boy in 1999. The change of tone was quite drastic as well. Different lyrical approach, and different production sound, could make anyone wonder if that was still the same band as before. The title song was quite new for the audience at the time, being written during the recording sessions of the album , it was not played live before. On the other hand, the B-sides has more familiar names: ‘Soul Trader’, ‘You’ and ‘Get Me To A Monastery’ were indeed played during the 2000 Scottish tour, and also featured on some video teasers during the recording of the album; but they have rarely been played since. 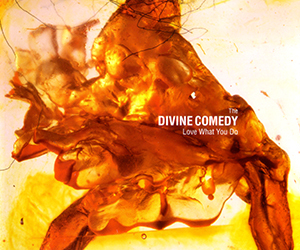 The minimalistic and homogeneous production of the songs is also something that did not happen on a Divine Comedy single since Something For The Weekend. Love What You Do received a lot of promotion, with a MTV-like video directed by Hammer & Tongs featuring the band playing all day in the studio, and reached position 26 in the UK charts. This radio edit differs to the album version on the intro and outro. Indeed, on the album the tracks is overlapped by the previous and next tracks (‘Eye Of The Needle’ and ‘Dumb it Down’); while here an intro affect has been added.